Philip Hammond must spend billions extra to end austerity, says think tank the Institute for Fiscal Studies (IFS). To maintain per capita spending across government departments which don’t have ring-fenced budgets, he must find an extra £5bn a year by 2023, it adds. And maintaining spending on unprotected services as a share of national income would require £11bn on top of spending plans set out in the 2018 Budget. The Treasury says long-term funding decisions will be made later this year. In its analysis the IFS said spending increases already promised by the chancellor would be swallowed up by commitments to fund the NHS, defence and international aid. And that could mean cuts in other areas it added. 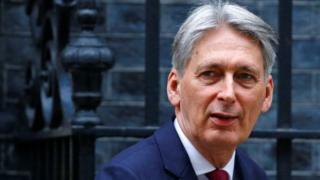 “The provisional totals set out in the Autumn Budget imply that day-to-day public service spending will increase by 6.1% – £18.2bn – between 2018-19 and 2023-24,” the IFS report said. But a Treasury spokesman said public investment would hit peaks not seen since 1979. “The chancellor has said that the Spending Review will take place in 2019, and that is the right moment for government to make long term funding decisions,” they said. Meanwhile, the IFS said a no-deal Brexit would mean lower growth, requiring either spending cuts or higher taxes. And it said in the short term the government might need to borrow more to fund a stimulus package to mitigate the impacts for the hardest-hit areas of the economy. But the IFS said any spending boost to spending would be temporary, and more austerity would eventually be required. Ben Zaranko, a research economist at the Institute for Fiscal Studies and an author of the report, said there could be more years of austerity for many public services. But he said it would be at a much slower pace than the last nine years. ← Brexit: How could it affect the fashion industry?